I thought I wanted to be in show business when I was in high school, but then I became involved in the Senior Play (“Mame” that year–something Bensie and I have in common). Too shy to try out for an acting role, though dying to, I worked backstage as prop guy and general go-fer. It was far too much work for the very fleeting reward of the cast party, so my stage career was derailed. 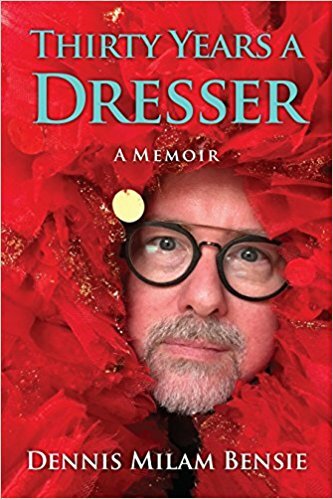 However, Dennis Milam Bensie’s memoir of life in the wings, Thirty Years a Dresser makes it all sound so damn fun I almost got the bug once again. Almost. Bensie’s anecdotes are wild and woolly shaggy dog stories he freely admits he’s exaggerated, though not by much. And they are hilarious. Thirty Years a Dresser provides plenty of laughs from the spurting blood vest in “Agnes of God” to the two hundred costumes required for “The Grapes of Wrath,” and Bensie writes about it all with equal parts love and loathing. Most memoirs I’ve read are at least partially self-serving, but Bensie’s stands out as self-deprecating instead (as did his previous One Gay American). He never takes himself too seriously–his craft and his subject, yes, but never himself. Moreover, although his role in the proceedings is central, he never focuses on himself, preferring to keep the spotlight on his subjects. And what subjects they are–from Rosie O’Donnell stories to less famous actors and even ones you even have to guess (but “played John Travolta’s younger brother in a blockbuster movie” is hardly tough to figure out), the backstage details come fast and furious. To take the smell out of costumes? Vodka and box fans. Who knew? Such are the tricks of Bensie’s trade, and he spills them all. I thoroughly enjoyed this book and if you have even a passing interest in the theatre, either on or off stage, you owe it to yourself to pick this up and devour it in one or two sittings, as I did. Highly recommended.